Enjoy a trip down Linux memory lane as we take early distros for a spin. A unique trait of open source is that it's never truly EOL (End of Life). The disc images mostly remain online, and their licenses don't expire, so going back and installing an old version of Linux in a virtual machine and getting a precise picture of what progress Linux has made over the years is relatively simple. We begin our journey with Slackware 1.01, posted to the comp.os.linux.announce newsgroup well over 20 years ago. The best part about trying Slackware 1.01 is that there's a pre-made image in Qemu's 2014 series of free images, so you don't have to perform the install manually (don't get used to this luxury). Many things in 1993's version of Linux works just as you'd expect. All the basic commands, such as ls and cd work, all the basic tools (gawk, cut, diff, perl, and of course Volkerding's favorite elvis) are present and accounted for, but some of the little things surprised me. BASH courteously asks for confirmation when you try to tab-complete hundreds of files, and tools to inspect compressed files (such as zless and zmore and zcat) already existed. In more ways than I'd expected, the system feels surprisingly modern. What's missing is any notion of package management. All installs and uninstalls are entirely manual, with no tracking. Over all, Slackware 1.01 feels a lot like a fairly modern UNIX—or more appropriately, it feels like modern UNIX might feel to a Linux user. Most everything is familiar, but there are differences here and there. Not nearly as much a difference as you might expect from an operating system released in 1993! The bootdisk for Debian 0.91 boots to a simple shell, with clear instructions on the steps you're meant to take next. The install process is surprisingly smooth. It works off of a menu system with seven steps—from partitioning a hard drive and writing the ext2 filesystem to it, all the way through to copying the basedsk images. This provided a minimal Debian install with many of the familiar conventions any modern Linux user would expect from their OS. Debian is now famous for its package management system, but there are mere hints of that in this early release. The dpkg command exists, but it's an interactive menu-based system—a sort of clunky aptitude, with several layers of menu selections and, unsurprisingly, a fraction of available packages. Even so, you can sense the convenience factor in the design concept. You download three floppy images and end up with a bootable system, and then use a simple text menu to install more goodies. I sincerely see why Debian made a splash. A pre-cursor to SUSE, Jurix shipped with binary .tgz packages organized into directories resembling the structure of Slackware's install packages. The installer itself is also similar to Slackware's installer. Because I wasn't specifically looking for the earliest instance, Jurix was the first Linux distribution I found that really "felt" like it intended the user to use a GUI environment. XFree86 is installed by default, so if you didn't intend to use it, you had to opt out. An example /usr/lib/X11/XF86Config (this later became Xorg.conf) file was provided, and that got me 90% of the way to a GUI, but fine-tuning vsync, hsync, and ramdac colormap overrides took me an entire weekend until I finally gave up. Installing new packages on Jurix was simple; find a .tgz on your sources drive, and run a routine tar command: $ su -c 'tar xzvf foo.tgz -C /' The package gets unzipped and unarchived to the root partition, and ready to use. I did this with several packages I hadn't installed to begin with, and found it easy, fast, and reliable. I installed SUSE 5.1 from a InfoMagic CD-ROM purchased from a software store in Maryland in 1998. The install process was convoluted compared to those that came before. YaST volleyed configuration files and settings between a floppy disk and the boot CD-ROM, requiring several reboots and a few restarts as I tried to understand the sequence expected from me. Once I'd failed the process twice, I got used to the way YaST worked, and the third time was smooth and very much a hint at the Linux user experience to come in later years. A GUI environment was my main goal for SUSE 5.1. The configuration process was familiar, with a few nice graphical tools (including a good XF86Setup frontend) to help test and debug mouse and monitor problems. It took less than an hour to get a GUI up and running, and most of the delay was caused by my own research on what resolutions and color depths Qemu's virtualized video card could handle. Included desktops were fvwm, fvwm2, and ctwm. I used fvwm, and it worked as expected. I even discovered tkDesk, a dock and file manager combo pack that is surprisingly similar to Ubuntu's Unity launcher bar. The experience was, over all, very pleasant, and in terms of getting a successful desktop up and running, SUSE 5.1 was a rousing success. The next install disc I happened to have lying around was Red Hat 6.0. That's not RHEL 6.0—just Red Hat 6.0. This was a desktop distribution sold in stores, before RHEL or Fedora existed. The disc I used was purchased in June 1999. The installation was fully guided and remarkably fast. You never have to leave the safety of the install process, whether choosing what packages to install (grouped together in Workstation, Server, and Custom groups), partitioning a drive, or kicking off the install. Red Hat 6 included an xf86config application to step you through X configuration, although it strangely allowed some mouse emulation options that X later claimed were invalid. It beat editing the Xf86Config file, but getting X correct was still clearly not a simple task. The desktop bundled with Red Hat 6 was, as it still is, GNOME, but the window manager was an early Enlightenment, which also provided the main sound daemon. Xdm and gdm were both provided as login managers so that normal users could log in without having the permission to start or kill X itself, which is particularly important on multi-user systems. Certain staple applications are missing; gedit didn't exist yet, there's no grand unified office application, and there was no package manager to speak of. GnoRPM, a GUI interface for RPM installation, review, and removal, was the closest to a yum or PackageKit experience it had, and gnotepad+ is the GUI text editor (Emacs notwithstanding, obviously). Over all, though, the desktop is intuitive. 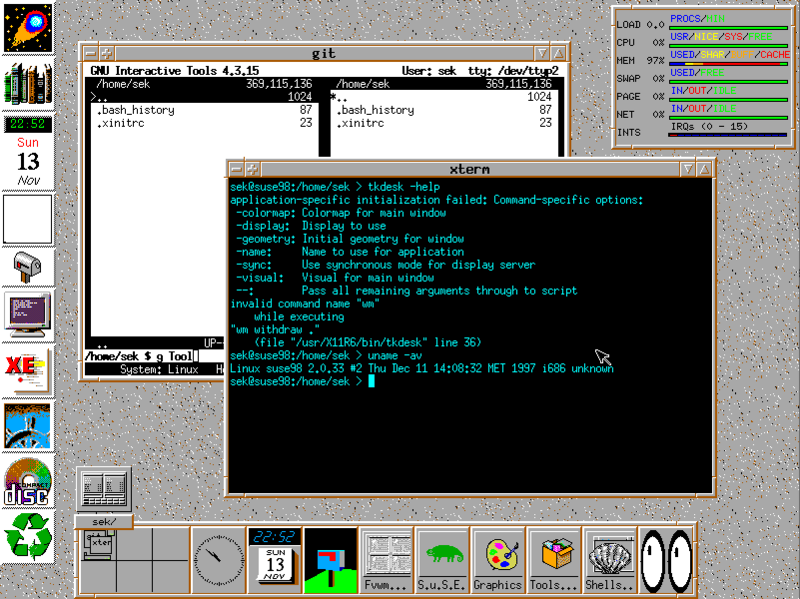 Unlike later implementations of GNOME, this early version featured a panel at the bottom of the screen, with an application menu and launcher icons and virtual desktop control in a central location. I can't imagine a user of another operating system at the time finding this environment foreign. Red Hat 6 was a strong entry for Linux, which was obviously moving seriously toward being a proper desktop OS. Mandrake 8.0 was released in 2001, so it would have been compared to, for instance, Apple OS 9.2 and Windows ME. I fell back on fairly old emulated tech to be safe. I'd thought the Red Hat installation process had been nice, but Mandrake's was amazing. It was friendly, it gave the user a chance to test configurations before continuing, it was easy and fast, and it worked almost like magic. I didn't even have to import my XF86Config file, because Mandrake's installer got it right. Using the Mandrake desktop is a lot like using any given desktop of the time, actually. I was a little surprised at how similar the experience was. I feel certain that if I'd somehow stumbled into Mandrake Linux at this time, it actually wouldn't have been beyond my ability, even as a young and not very technical user. The interfaces are intuitive, the documentation helpful, and the package management quite natural, for a time when it still wasn't yet the mental default for people to just go to a website and download an installer for whatever software they wanted. 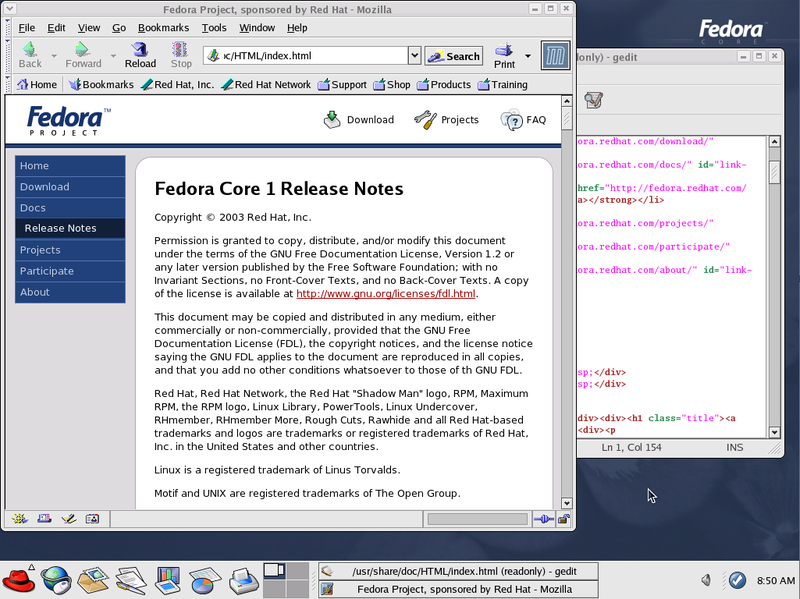 In 2003, the new Fedora Core distribution was released. Fedora Core was based on Red Hat, and was meant to carry on the banner of desktop Linux once Red Hat Enterprise Linux (RHEL) became the flagship product of the company. 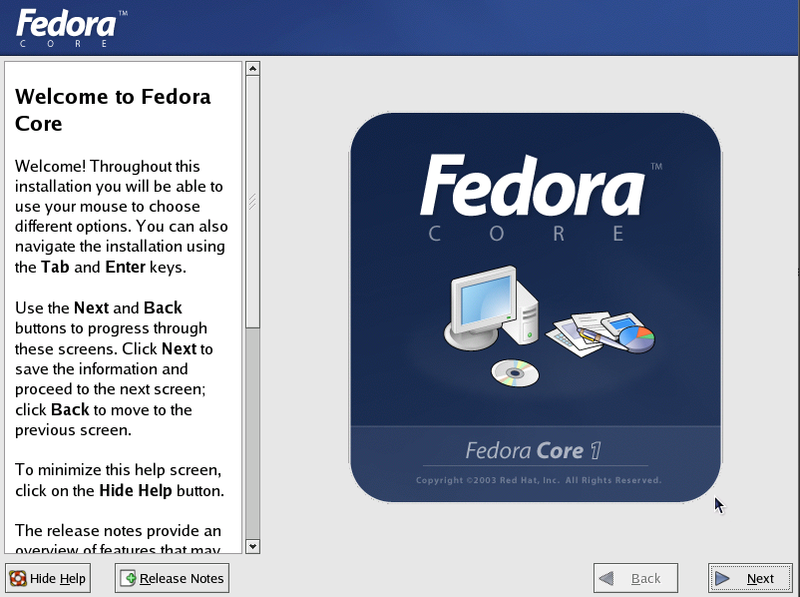 Installing Fedora Core is simple and familiar; it uses the same installer as Fedora and Red Hat for the next 9 years. It's a graphical interface that's easy to use and easy to understand. The Fedora Core experience is largely indistinguishable from Red Hat 6 or 7. The GNOME desktop is polished, there are all the signature configuration helper applications, and the presentation is clean and professional. A Start Here icon on the desktop guides the user toward three locations: an Applications folder, the Preferences panel, and System Settings. A red hat icon marks the applications menu, and the lower GNOME panel holds all the latest Linux application launchers, including the OpenOffice office suite and the Mozilla browser. By the early 2000s, it's clear that Linux has well and truly hit its stride. The desktop is more polished than ever, the applications available want for nothing, the installation is easier and more efficient than other operating systems. In fact, from the early 2000s onward, the relationship between the user and the system is firmly established and remains basically unchanged even today. There are some changes, and of course several updates and improvements and a staggering amount of innovation. Slackware quietly continues to this day. Whether you're new to Linux, or whether you're such an old hand that most of these screenshots have been more biographical than historical, it's good to be able to look back at how one of the largest open source projects in the world has developed. More importantly, it's exciting to think of where Linux is headed and how we can all be a part of that, starting now, and for years to come. I used Mandrake exclusively back then. We even used it in the classes we taught. Countless students that cut their teeth on Mandrake in my classes have gone on to bigger & better things. I've since moved on to Debian/Ubuntu and haven't tried Mageia, but if it weren't for Mandrake, I probably wouldn't be where I am today. Mageia is quite nice. I ran it on a laptop recently whilst waiting for Slackware 14.2 to be final'ed. Definitely a solid distro with some really nice added features (like its centralised control panel, and urpm).I'd run it more often if I weren't already comfy in my Slackware and Fedora worlds. Great article Seth. It's like a trip to the Smithsonian of Linux. 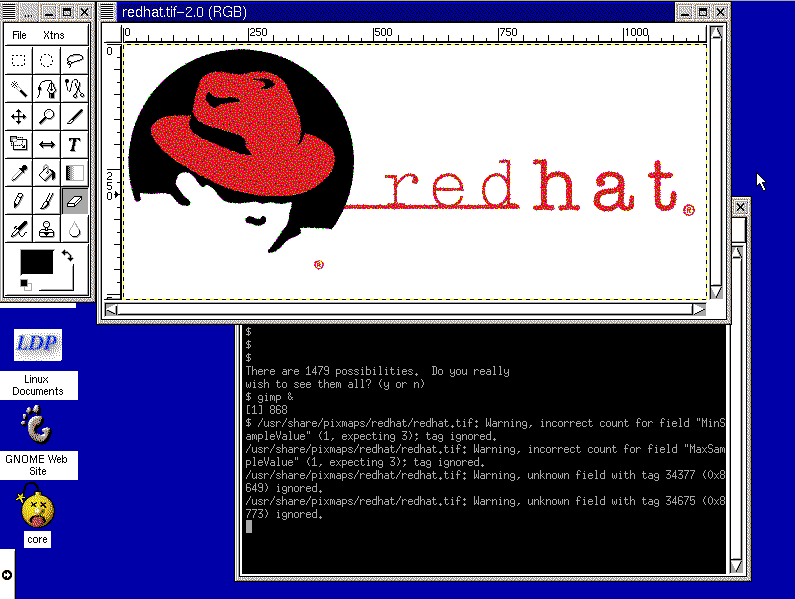 Red Hat 6.0 was my first successful GUI on Linux. It gave me hope and a vision of a new OS. Little did I realize how much that would change the course of history and my life in particular. I loved Mandrake and it was Mandrake that offered a free e-course that taught me the basics of using Linux. Fedora Core was a steady friend too. Thanks for bringing back many memories. Don't forget that there were paid for Linux distros as well,I used the free versions of Xandros 3 and then paid £60.00 for the then New Xandros 4,in it's time it was something like Linux Mint because it came with all the codecs and apps that you might want,shame it is no more ! Several of the distros discussed in this article were either paid for, in a computer store (the ones listed without a download link were installed from CD ROMs during the writing of this article), or had subscriptions of some kind available; Mandrake offered paid support, Slackware continues to offer subscriptions (I know; I'm a paid subscriber), and of course Red Hat still offers subscriptions via RHN. I never tried Xandros; the one computer I owned that shipped with Xandros on it, the legendary eeePC, got Mandriva "Mini Me" installed onto it. You should install into a Qemu VM, just for old-times' sake. We should fire up Minix if we want to go back. I was using Linux (Slackware, I think) for one specific ham radio application when I discovered KDE 1.0 and thought "Hmmm... this could be a regular desktop". I pretty have much stayed with Red Hat Linux, then Fedora ever since, although I'm comfortable with Debian/Ubuntu. OK, a confession: this article was mostly written as a way to deal with my extreme jealousy over people like you, who were savvy enough to discover Linux way earlier than I did! Agreed. Stability and consistency is not a bug, but an all-too rare feature. Sure, there have been updates and changes, but the core has remained the same, and there's a certain guiding principle to much of the design. I think this is easily one of my favourite features of posix/unix/linux. Yes, modern Linux has accomplished amazing things. Its ability to install onto pretty much any computer you throw at it, often with at least 90% of its drivers loaded and configured sensibly, should impress far more people than it does. People don't understand how cool that is! I have to admit I'd not heard of that one. So sad to lose a member of the community. 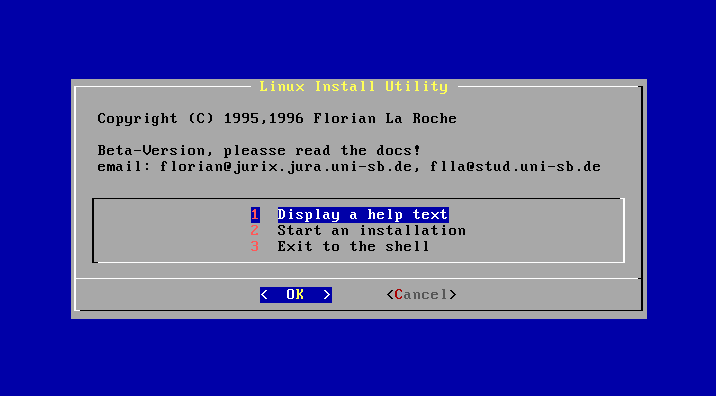 When I first installed Linux, circa January 1994, it was Slackware from floppies. The various types of apps you needed were on disk sets denoted by a letter. IIRC, S was for development tools, N for network-related stuff, etc. Setting up X was hellish, and the config files referenced the danger of frying your monitor if you used the wrong settings. Add in the need to compile your kernel (before menuconfig, even) and that still being the days of IRQ jumpers and "do I need a 16550 UART to drive the serial-attached modem?"... well, it was... a learning experience. Yes, but the original comment was specifically about the historical sets, so it's nice to be able to reference the sets as they appeared then rather than as they are now. That's the nice thing about Slackware, though; it truly has not changed drastically since its 1.x series. Amazing that it combine such consistency with constant growth. You're using David Revoy's cat generator. That's the first instance I've seen of it in the wild. Nice! My first Linux version was redhat 6.0, followed by Fedora. I stumbled upon some original SUSE (9 or 10) Linux CDs and set up Linux on a couple of PCs in our campus computer lab as the new desktop OS after a Microsoft licence compliance raid. This is quite a nice montage. Nice! bonus points for the Linux/MS swap on campus! Wonderful article. Brings back memories of the good/old days and an appreciation of much things change and how much they didn't. I think any student should go through this experience once. Even with other OS of the same period,to put things in perspective. I'm inclined to agree with you. I did these installs initially for laughs, but I ended up accidentally learning a lot about modern Linux. This, of course, would be harder to do with non-open source operating systems, unless you just happen to have all the install discs lying around (and some people do), but even then, some closed OS's restrict what hardware they can be installed on. But I guess that's why there are places like computer museums. Thank you for this, brought back many wonderful memories sitting in my room as a young kid compiling and fiddling with Slackware ca 99-00. Will never forget the happiness when I managed to save up and buy myself SUSE 6.1 or if it was 6.2 CD box in the early 2000s. Sounds great. I wish Linux CDs were still available in stores. Um, edit: I wish there were still computer stores. My intro to Linux was mostly through books and magazines that included the OS disc in the back. I remember when I found out there were books about computers that included a free OS in the back cover. Mind -> blown. Xandros was also my first Linux OS. Xandros tried to be a home and commercial distribution. (founded 2001) Though now defunct, Xandros was a leader at one time. It also kept me from using Linux for quite some time as the LILO boot manager kept refusing to boot to my Windows XP OS in my dual boot installation. I was constantly re-installing XP, and to new to go Linux alone. I no longer run Windoze, just Linux Debian or Ubuntu, both Mate desktops. Also Grub seems to me a much better boot loader than LILO, though I think LILO is still around. LILO (and eLILO for [U]EFI) are most definitely still around! It's the default boot loader for Slackware, and therefore the bootloader on my desktop and personal laptop. I know it's really useful and all, but I kinda feel like dual booting is often more problematic than it's worth. I think, especially now that computers are pretty well spec'd, if I had to run two OS's (I do not, but if I had to...) I would just use qemu-kvm. Great article. Reminded me of my own journey with Linux. I first used Linux in November 1997 as part of a class "Intro to Current Operating Systems" (we also looked at Windows NT 4.0, Windows 98 and Novell Netwear. My instructor made no secret of the fact that he preferred Linux (I think it was Red Hat 5 and it was running FVWM95 with xroach running by default) over the proprietary alternatives due to its price, stability and security. This stuck with me. In 2002, I succeeded in loading Red Hat 7.3 onto my computer. With Red Hat 9.0, I emigrated to Slackware as I wanted to try something different. In 2009, I emigrated to Ubuntu and am now using Xubuntu. I love the packaging system, the security, the stability and open source in general. I love that so many open source projects focus on security and security best-practices. Very cool. After discovering Linux on my own, I took a weekend course on Linux at a community college, taught by a literal mountainman (lived on a farm in Yellowstone, raised llamas, had a UNIX beard), and it was the most amazing two days of my life. I keep wishing I could offer a course locally so I could be that guy for someone else, but then I'd have to raise llamas. Thanks for the reminder that open source is not necessarily more secure than proprietary technologies and that such securities require constant maintenance. Thanks even more for sharing your first Linux learning experience. As you stated, regarding my comment above, very cool. What a fantastic way to learn Linux and your instructor clearly made a positive impact on you. Thanks again for writing this article. My first was Slackware. I remember installing from floppy and wikipedia says 2.1 was 73, and 1 was 24. I recall somewhere around 30 so it must have been around 2.0. I got away from Linux for a while then tried RedHat and a couple others and came back to Slack around version 9 or 10 and have been Slacking since. My first Linux was Slackware 12, but I updated quickly to 12.1, which was released shortly after my first install. 12.1 solved a wifi driver issue I was having, during which time I learnt to compile kernels because I didn't know about modprobe. Prior to that, I'd been running...let's call it a "proprietary UNIX" in earnest for about a year, so compiling stuff on Linux from source was actually *easy* by comparison. Excellent article. My first Linux experience was with Red Hat 6.0, where I setup a telnet server. In the interest of posterity, I wish the images for these old Linux distros could be made available as cloud compute instances in AWS, GCP or any other cloud service providers. A virtual Linux museum for historical archiving purposes, spawn one and indulge in nostalgia. I reckon if someone donated heaps of space, some .qcow2 images could be created and posted someplace... but then again, part of the full experience is the install! I can remember the first time I got a computer. It was in 1995, a Packard-Bell. It had some weird setup on it that was extremely difficult to use and I still don't have any idea what it was or even if it was an OS, but I got so frustrated with it in just a few months that I got W95 from a store and installed it. Remember, I'd had no training with computers, had never even seen one before this one, so I was on my own learning *everything*. Unfortunately I didn't know there were such things as other OS's, and only ever saw things 'M$' in stores. I was so sick of W95 that it almost seemed a relief to hear that W98 was out when it finally got out there. I installed that faster than I could get the money out of my wallet, just hoping for a better experience. So, I found Linux. It was now late in 1999 IIRR and the first distro I found was Redhat. I don't remember the version, but it gave me fits and was too difficult for me to get working very well so I went searching again (remember too, that no stores in my area carried anything Linux so I couldn't just drive to one and buy the disks...I had to wait two or three days for the download of the iso on my dial-up!). I then found Mandrake. I believe it was 6.1 but it's possible it was 7.0. Anyway, I sort of was able to get that working on my system (by this time I was way ahead of the curve about building my own, so my system(s) were never things I worried about). Mandrake was klunky but it worked and I was slightly happier with it than W98SE, but I still wanted better. Then I found SuSE 7.3. For some reason it seemed to work pretty good and I even kind of liked YaST. So, I ended my search and stuck it out with SuSE for several years. One day I very suddenly just stopped everything I was doing at the computer and like a giant lightbulb shining in my room, I realized that I wasn't constantly agitated or worried or frustrated or anticipating bad things to happen while doing anything on my computer! I was actually *enjoying* being on the computer! It was so...foreign a concept compared to when I used M$ that it just blew me away at that moment. I didn't worry about BSOD's, or lock-ups or any of the constant problems Windows always had. But good things sometimes do have to end and I began to hate that eventually SuSE (I was now up to version 10.3) started to collaborate with M$ and some other BS going on, and again started my search for a different distro. I finally came upon Slackware, version 13 I think. It was a little harder to get my head into as it isn't a hand-holding distro, but I stuck it out and I've been with it since then, now at version 14.2. The only downside I've had in the years using Slackware is now at 14.2 PV decided to use pulse audio instead of staying with alsa. Now my system is darn near useless as my sound-system for the house. As an audiophile, the sound output of pulse audio is bland, under powered, almost muffled and gives no way to make adjustments as one could with treble, bass, surround, etc, etc like I could with alsa. IMO, pulse audio is an abortion gone bad, but it was used instead of alsa because it works better with bluetooth supposedly (which I use nothing of nor need personally). Other than that, it's the best distro yet, imho. The addition of Pulse to Slackware actually doesn't change the sound system at all; Pulse sits on top of ALSA, it does not displace it. You can use Pulse or ALSA, it just depends on what you tell an application to use (or what the application has been hardcoded to use, in some cases). EDIT: next month's Multimedia Makers column will be about using Pulse Audio :-) Month thereafter, I'll cover JACK. Interesting article. I'm one of the ones you're jealous of. I started in '92 with SLS and Linux 0.93pl3 on my 486 after 386BSD wouldn't boot. When SLS would not fix things like wrong permissions on /etc, Slackware was created and I switched to that. Yes, I had X11 running and it was painful. Sometime later I went to Red Hat. I think 3.x. I continued with it and went to another RPM based system with Mandrake. I think that was 5.x. I switched back & forth as device drivers appeared. The pinnacle was when WiFi came out and I needed support for the PCMCIA card on my laptop. I had a dual monitor Red Hat 9.0 system with 384MB RAM and a P133 at work. I'd build up 100 windows (xterm, browser, email, emacs, etc == 1 window) over a week. We used OpenBSD for firewalls and they were rebooted weekly so all the xterms got disconnected. I had 6 workspaces on each monitor and a different window manager on each. I couldn't drag windows between monitors, but I could have the workspaces separate. That feature disappeared when someone decided Xinerama was the only way for multiple monitors. Since then I've done Fedora, CentOS, RHEL 5/6/7, Ubuntu, OpenSolaris, NetBSD in various aspects. X11 got easy. Yum finally came for dependencies on RPM like apt is for deb. Now I'm doing OpenStack clouds which is a whole 'nother explosion of tech. I used free-type software (tex, gnu/emacs, etc) way back in the late 1980s. When gnu/linux came along in the mid 1990s, I naturally and immediately deleted my mid-1990s Windows hard disk and installed linux without absolutely any hesitation. I bought one of the distro's (can't remember which one), but it came with a book in a box. It wasn't easy, but I noticed that it did (and continues to be) become about ten times easier to install with every passing year. - Its utilities for system repair and troubleshooting. I say that was amazing at that time installing (or running live from CD) an OS which detected all your hardware without configuration! Yes, agreed. Knoppix was a ground-breaker. I still run BasicLinux, a two diskettes Slakware Linux in a 80386 with 5 MBy memory with a yellow Hercules monitor. It also runs MC and MUTT. Very nice! I declare you the winner. I'm happy to see, from your comment, that Open Mandriva is indeed active. I've kept up with Mageia and keep meaning to look in on Open Mandriva but so far have neglected it.